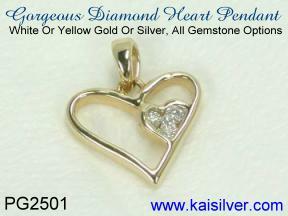 It is quite often that the Kaisilver support team receives requests for or queries related to big heart pendants. When you talk about large pendants, it could be a jewel with one big heart shaped gemstone. You could also have a gold or 925 silver heart pendant where the basic pendant size is large but, there are no gem stones at all. Another interesting option for a big heart pendant would be to include small gems or relatively small gems, in a big pendant that is made in a heart shape. The main question regarding big gem stone heart pendants is whether, all gems can be cut in huge heart shapes. The answer is that, technically nothing stops a gem manufacturer or gem cutter from picking just about any gem and cutting it to a big heart shape. But other issues, limit the gem size that can possibly be used for making a big gold or 925 silver heart shape pendant. Glance at the big blue pendant in the image below, this is the famous Heart Of The Ocean Pendant used in the blockbuster movie, Titanic. Excuse us as we take you through a brief stroll regarding the story and happenings related to this big sapphire pendant. 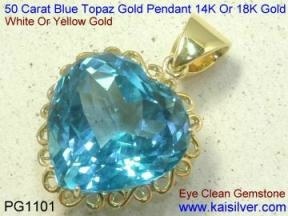 In the movie Kate Winslet wore a large blue 'sapphire' heart pendant, glittering diamonds hugged the edges of this now famous pendant. Few people are aware that the 'sapphire' in the movie was a fake! Since historic records show that a big blue pendant was aboard the Titanic during the time that it went down, the producers of the movie incorporated this bit into their script. However the large heart pendant worn by Kate Winslet was a cheap factory made CZ (cubic zirconium) stone. This is a synthetic stone that can be manufactured in almost all sizes and colors. It is then cut into the desired shape and polished. The blue heart pendant in the movie is around 1.5 inches high, this is about 3.75 cm or 37.5mm. To give you a cost comparison of a blue cz that large and a good blue sapphire of the same size, the blue cz would cost around 200 U.S$ to 300 U.S$. The blue sapphire would shoot beyond 1 million U.S dollars. If you would like to know, the longer story about the big heart pendant in the movie, here is a quick note. The fake pendant used in the movie became very popular, thousands of cheap fakes flooded the markets. The jeweler who made the fake blue pendant, then went on to make a stunning natural sapphire heart pendant. This jewel was valued at around 3.5 million U.S$, and was sold for just 2.2 million U.S$. This price reduction for some interesting reasons. The sapphire in the new heart pendant weighed about 170 carats and was mined in Sri Lanka (formerly Ceylon). High quality diamonds surrounded the center heart sapphire, the entire jewel was cast in platinum and not white gold. Okay now sorry for the detour and back to our main topic about big heart pendants. Important: Firstly, we need to define big when it comes to gemstones. Gemstones are priced by weight (carats) and generally the price per carat moves up as the gemstone size increases. In the case of special shapes like heart, there is a premium added to the price tag for gems like ruby, sapphire, emerald, tanzanite and even diamonds. Gem shape aside, the important thing is that the price starts to increase steeply (per carat) as the gem size moves up. Keeping the above price logistics in mind, the limitation of size in defining 'big' will vary from gem to gem and ofcourse from person to person (based on budget). For most of us, a large heart sapphire would be limited to a 3 to 4 carat gemstone. On the other hand, a blue topaz could be moderately priced even at 30 to 40 carats. Talk about a lemon quartz gem with a heart shape and, you will be pleasantly surprised with the price for gems as large as 50 to 70 carats! The table below will give you an idea of what is generally termed as 'big' for some popular gems. Keep in mind that variations in individual budgets could still place limitations. This relates to natural gems and not factory made fakes. Ruby, sapphire, emerald, tanzanite. Does not include ruby and sapphire from India which is basically too included to be durable. 3 to 4 carats. Aquamarine, rhodolite garnet, fire opal, white opal, pink opal, morganite. 3 to 5 carats. Pink tourmaline, green tourmaline, red garnet, peridot. 3 to 6 carats. Amethyst, citrine. 15 to 20 carats. Swiss blue topaz, london blue topaz, sky blue topaz, white topaz, smoky quartz, lemon quartz. 20 to 40 carats. Black agate, brown agate, rose quartz (included), rutilated quartz, blue lapis, white quartz. 20 to 40 carats. The above details are just a guide to give you and idea of gem sizes normally available for different gems. It does not mean that the gems in the maximum sizes mentioned are cheap. We will now discuss a few interesting ways to help you get a big heart pendant, that is likely to be within your budget. The options cater to a range of prices, so do write to our support experts at sales@kaisilver.com if you have any specific requirements. We can surely provide a gemstone not mentioned in the above table as we, handpick and custom cut all gems in all shapes and sizes. Here are some ideas to customize your big heart shaped pendant to suit your budget. Metal: If everything could go as we wished, most of us would love to have our pendant made as a big heart gold pendant! This might have been possible for a large budget range a few years ago but, gold prices have today made that a dream for most of us. Though the exact price of a gold heart pendant would depend on current gold price, dimensions, gemstone etc - pay close attention to the price tag and disuss the requirement with your jeweler. Yes you might come across a brave jeweler, who can make a big heart pendant in gold with a surprisingly low gold weight. Do not fall for such gimmicks, a light weight pendant might appear cheaper initially but low durability will involve a constant expense for repairs and replacements. You should therefore also consider a big silver heart pendant, the metal is also becoming dearer but is still, much more affordable as compared to gold. We are fully aware that most of the silver heart pendants that you come across will have substandard gems, design and craftsmanship. There is no technical justification for this shabby production but, the greed of jewelers make them concentrate on gold jewelry. 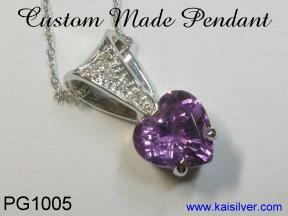 While Kaisilver is not the only source for your heart pendant, we have something that no other jeweler can offer. By using the same production and designing teams for gold and silver jewels, we prove our commitment to craft quality jewels irrespective of the metal. A gold or 925 silver heart shaped pendant, will have the same quality of design, gems and craftsmanship. The stringent quality standards are maintained irrespective of the metal that you choose for your pendant. Since all jewels are fully tailor made to buyer specifications, the high degree of customization that we provide applies to both metal options. With or without gems: Another very relevant question that you need to give attention to. It is quite obvious that a big heart gemstone pendant would have the cost components of the gem and the metal. Since the meaning of a large heart pendant is in the shape of the jewel, options can be utilized to moderate the price point. For example, if you wanted a 1 inch heart pendant (2.5cm or 25mm) - leave aside gem options like ruby, sapphire, emerald, tanzanite and even aquamarine, morganite and tourmalines. A simple gold or silver heart shaped pendant with no gem stone might be a good idea. The design of the pendant can also help you reduce the metal component in the jewel. We are not referring to reducing metal weight at the cost of durability. You will basically need to decide which is the important factor in your heart pendant. If you do insist on a sapphire pendant, options to reduce costs and gem size requirment will be almost mandatory. On the other hand if you need a 1 inch pendant with a single stone, then remain in the gems that will be moderately priced even in that large size. You should ofcourse discuss your requirements with your jeweler before making a buying decision. Small or big gems: If you have grasped the content of this web page so far, you will know that the price of most gems is also influenced by gem size. Let us presume that you need a big diamond heart pendant, remember that diamonds are expensive stones. Most of us would consider diamonds in 2mm to 4mm size, heart shaped diamonds are even more expensive. But ofcourse a heart diamond pendant with a single 5mm heart shaped diamond, would by no means qualify as a big heart pendant. So what do you do if you need a diamond heart pendant that is around 1cm to 2cm big? Keep in mind that diamonds in the 2 carat and above range could wear price tags that are as high as 10,000 U.S$ to 100,000 U.S$ per carat. It is not uncommon to hear of 4 carat diamonds be auctioned for around 2 to 5 million U.S$. Small gems can give you a big heart pendant. Consider a heart shaped gold or silver pendant where, the stones are diamonds are set only along the border. Or what about a heart pendant where the heart shape is only the border. This is a very popular concept for a big heart pendant made with a limited budget. It is often the only option for some gems and ofcourse for diamonds. A pendant with this concept, could have alternating blue sapphires and diamonds along the border. The gem combinations are ofcourse unlimited, your imagination and budget will set the boundaries. Only a gemstone: Have you come across a big agate, lapis or rose quartz heart pendant where there is almost no metal. In this case a hole is drilled right through the top of the heart gemstone, a small gold or silver bail (loop for the chain) is mounted on the top. You might also come across cases where the chain or chord passes directly through the hole in the stone without, any metal bail at all. We would ideally not recommend such pendants as they 'mutilate' the gemstone. However in the case of cheap gems, it might be one way to get a low cost large heart pendant. Fake Gemstones: This is something you need to be careful about. There is nothing wrong in wearing a fake ruby, sapphire or any other gemstone. 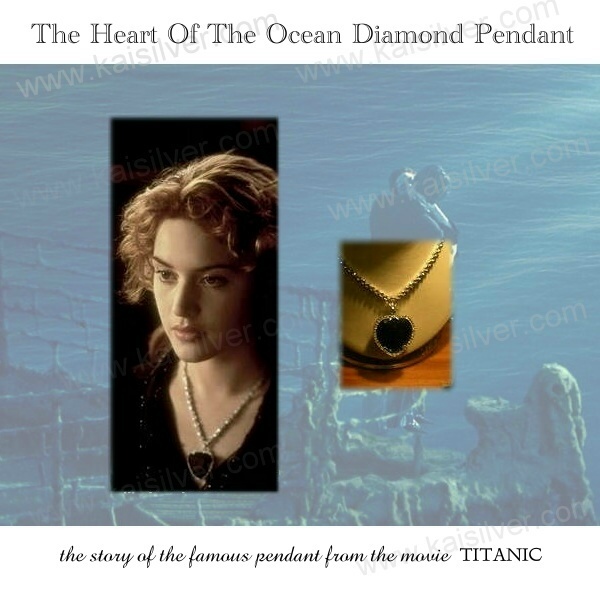 Remember the gorgeous sapphire heart pendant worn in the 1997 Titanic movie, was also a fake! You will still have to include metal, design and production costs in the overall price tag. We would like to let you know that the Fake sapphire pendant worn in the movie was cast in white gold and was made at a cost of 10,000 U.S$. If you wanted a similar pendant we would suggest white CZ (for diamonds) and a colored CZ for the stone. Get a custom made big heart pendant done in sterling silver. The price should be in the 600 U.S$ to 900 U.S$ range depending on gem size and design. The saddest part is when a buyer pays for a jewel thinking that it comes with a natural gem and, lands up with a cheap imitation stone. To avoid such a situation, spend time checking for the right jeweler before you start the search for your large heart pendant. We do hope that you have gained some valuable information related to big heart pendants through this report. While we do not promise to make you a gem or jewelry expert with this report, we sincerely hope that you can better evaluate options when looking for a heart pendant. Our support team at sales@kaisilver.com will be glad to assist you with any further information that you need. We will once again repeat that we are not the only source for highend custom jewelry but, we surely are the only provider who cares to educate and inform buyers. The idea is to encourage buyers to make their own well informed decisions. We present some interesting conceps for a heart pendant below. Each of the pendants has a short note to give you an idea of the options available to you. This is one of the important objectives of compiling this report on big heart shape pendants. The suggestions will be useful irrespective of where you finally get your pendant from. 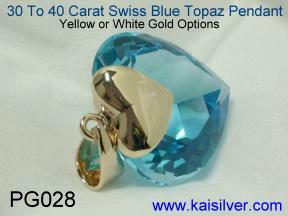 A big heart pendant, choice of white topaz, sky blue topaz, swiss blue topaz or london blue topaz gem stone. This large gemstone heart pendant is available with other gem options too ... more. The design for your big heart shape pendant can be yours or ours, here is another design idea for a big gold or silver heart shaped pendant. Custom made in gold or 925 sterling silver ,,, more. A big diamond heart pendant needs to have a design that is capable of incorporating more than one small size diamond. The PG250 diamond heart pendant is fairly large at around 2cm but,the diamonds are just 2mm rounds ... more. A classic heart pendant, this big heart shaped pendant uses a modestly sized heart shaped gem. Suitable for ruby, sapphire, tanzanite or even tourmaline and aquamarine gems. Available in gold or 925 sterling silver ... more. We custom cut all gems in the shape and size that you need. There is no minumum order requirement for value or quantity, even single gemstone orders are welcome. You can buy just the loose gemstones or request for a complete custom jewel to be crafted in gold or sterling silver. The design for your jewelry can be yours or ours. Contact our support team at sales@kaisilver.com with any questions that you might have. The Content On This Web Page And Website Is Protected By Copyright Laws, Please Do Not Reproduce In Any Form.